^ Gielink, Dirk; Maarten Buitenhuis; René Moelker (2007). "No Contractors on the Battlefield: The Dutch Military's Reluctance to Outsource". In Thomas Jäger, Gerhard Kümmel. Private Military and Security Companies: Chances, Problems, Pitfalls and Prospects. VS Verlag. p. 149. ISBN 3-531-14901-6. ^ "ERROR 404: Sorry the page you are looking for no longer exists". Archived from the original on 2011-07-18. Retrieved July 28, 2014. ^ Franklin, Jonathan (2004-03-04). "US contractor recruits guards for Iraq in Chile". The Guardian. Retrieved 2015-11-25. ^ Isenburg, David (September 27, 2012). "The Perils of the Punctilious PMSC Prosecution". Huffington Post. Retrieved 29 August 2016. ^ "Before Shooting in Iraq, a Warning on Blackwater". The New York Times. 2014-06-29. ^ "Blackwater 61 – Cockpit Voice Recording". Newsgroup: rec.aviation.military. Usenet: fedg0c$1jf$1@aioe.org. Retrieved August 7, 2012. ^ "Abtan, et al. v. Prince, et al. and Albazzaz, et al. v. Prince, et al". Center for Constitutional Rights. Retrieved 2017-02-02. ^ Sizemore, Bill. "Lawsuit now accuses Xe contractors of murder, kidnapping". Virginian-Pilot. Retrieved 2017-02-01. 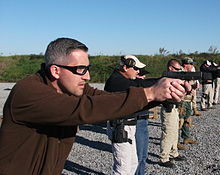 ^ "Blackwater Founder Implicated in Murder". The Nation. ISSN 0027-8378. Retrieved 2017-02-01. ^ Ciralsky, Adam. "January 2010: Adam Ciralsky on Blackwater". The Hive. Retrieved 2017-02-02. ^ Sly, Liz. 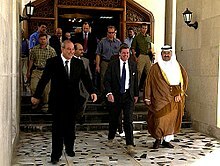 "Iraqis say they were forced to take Blackwater settlement". Los Angeles Times. ISSN 0458-3035. Retrieved 2017-02-01. ^ Risen, James; Mazzetti, Mark (21 February 2013). "Case Ends Against Ex-Blackwater Officials". The New York Times. Retrieved February 27, 2013. ^ Press, Associated (August 7, 2012). "Former Blackwater company settles arms case". Tampa Bay Times. Retrieved 2 February 2017. ^ Reuters (Aug 7, 2012). "Blackwater Successor to Pay Fine to Settle Arms Charges". The New York Times. Retrieved 2 February 2017.